In this thread, I'm going to read through the original Spelljammer box set from 1989. The picture was linked via Jeff Grubb's blog on the origion of the Spelljammer setting, which should probably be required reading for this thread. To summarize, it was an idea to push the limits of what they considered "D&D" at the time, focused on imagery that required 'physics' far different from the real world, and had to work within the format that TSR was using for box sets in that era. My personal history with Spelljammer was getting that box set and using the heck out of it. I skipped many of the add-ons as they seemed more 'adventures' (which I could make up), not expansions (which I felt I was less qualified to make up). I did get a few books, including The Complete Spacefarer's Guide and eventually the Legend of the Spelljammer, a massive setting that was essentially similar to today's big adventure path type works. I can't talk about Spelljammer with discussing it's relationship to the later Planescape. I ignored Planescape for a while as I felt it was replacing 'my' setting, and wouldn't be as good. I later grew to enjoy Planescape due to its own strengths. They're similar in many ways, but I have to admit that Planescape has the big advantage of being much less intrusive: Adding Spelljammer to a setting often ended up involving retconning entire ports for flying ships and such into settings, while a link to Planescape could be any door-like object or portal. Magic flying ships that zoom a round in a setting that mixes pirate lore, Star Wars, historical 'age of sail' memes, and other influences using a peculiar set of physics that allwos every 'solar system' (or equivilent) to be self-contained in a crystal sphere. Oh, and hippo soldiers and snake/spider slavers. It was pretty cool, and probably the D&D material I got the most use out of. Let's start with the first of the books, the Lorebook of the Void/I]. The Beholder is an interesting variation. Spelljammer ran with (or did it originate) the idea that the Beholder race was prone to mutation, and every Beholder saw itself as the epitome of perfection. All other Beholders were flawed in some way... But those of different looks were much more flawed and must be destroyed. So Spelljammer had an ongoing Beholder war as a setting element, albeit one I don't think was used too often. This Beholder (Credited to Jim Holloway, who did the interior art as well, and I believe is better known for his rubbery Paranoia pieces) is a neat variation on the theme with a smaller (but still massive) central eye supported on cyclopean (heh...) muscles. it's a little weird in that it almost looks like it was a 'normal' skull-shape at some point: there's a vague suggestion of a nasal cavity and eye sockets to the sides of the muscles framing the central eye. Also, the almost 'chromed' carapace is a bit different than normally seen, although it works. Perhaps it's meant to be 'dirty' bone-colored shell? I like the composition. It shows what would be an amazing encounter: moving around an asteroid field, trying to survive and strike at one of D&D's iconic and fear-inducing foes. Some highlights from the credits: This is Jeff Grubb's design, with input from Steve Winter, Jim Lowder, Jon Pickens, Karen Boomgarden, Eric Severson, and Kim Mohan. "Spiritual Guidance" from Jim Ward. Art is a Jeff Easley cover (The tiny pic earlier) and as mentioned Jim Holloway for the book covers, interior art, and ship designs. There's a Cartography credit for 'Diesel' (Dave LaForce) and color inking and silhouettes by Roy Parker. Graphic Design and Typography (which we will discuss briefly) are credited to Stephanie Tabat and Angelika Lokotz/Gaye O'Keefe. A product such as this is the result of much cross-fertilization. To those friends and associates who contributed and are not listed above, we extend our thanks and apologies. The top chapter header was done in an otuline style that had a hint of 'sci-fi' design to it. Black-background text boxes were very common. The page shown uses one for a full column, but other pages use a horizontal full-width border along the bottom for quotes and such. (The full-width quote at the bottom of the page is absent in this book, I believe, but became common later). Typeface for main body was still close to the 2e standard. Tomorrow we'll dig in. There's a nice full-page foreword from Jeff Grubb that may restate a few comments from his later blog post, then the table of contents, and finally digging into the meat of the book. If this project is weird enough to be considered a potential movie idea, then we may have done our job here. That's the 2nd paragraph of Jeff Grubb's foreward... if anything, I think the problem would be making Spelljammer recognizable enough to craft a movie around it that would appeal to a mass market. Still, it's an ambitious way to start a setting, isn't it? The brainstorming session in a Lake Geneva restaurant is mentioned, although just that the waitress thought that they were movie scouts working for Spielberg. The latter account would state that the waitress mistook assistant manager Warren Spector (who would later go on to make some great video games like the masterpiece Deus Ex) was mistaken for Spielberg. It's pretty honest, though: There's a note that they knew they couldn't "overturn existing campaigns" which presumably meant nuking the Realms was off the table. They wanted to make this a link between the AD&D worlds (defined as the Realms, Krynn, and Greyhawk as of this writing) and created a setting and rules to allow this. An important explanation that makes the setting gel for me is the admission that the wacky physics and other mechanics were in part a way to deal with the vast distances and other not-fun parts of space travel. There's some meaningful ideas here about how the setting informed the mechanics which informed the setting... A big circle of each aspect modifying the other. Dave LaForce is given some of the credit for working otu the details of the wacky physics (which we'll get to in due time). Holloway, Winter, and others are called out for their contributions as well. Grubb's anme is on the project, but it's a group effort. Great cover in my opinion. The human's pose feels like it's taken from a pirate movie, which does make me feel a little sorry for the Mind Flayer who appears to be in the midst of being robbed. The ship is one of the lesser iconic designs for the setting, the Tradesman which is a common ship in countless roles. Infinite space; stars as flaming spheres of super-heated plasma; movement through space as a balance of scientific forces, thrust providing acceleration and maneuverability; scientific fact backing up natural phenomena; life on other planets built along blocks of carbon or silicon elements. Forget all that. It's wrong. The foreword mentions that this supplement can be used with the existing settings, without "violating existing campaign material." However, it's also noted that going the route of space will change an existing campaign quite a bit. This foreword does say that this book should be read first. My mistake, and one we can rectify. An interesting bit of Spelljammer is it didn't add just a single 'outer space' to the game, but two! An important concept to keep in mind is that there's Wildspace and the Phlogiston or flow. Wildspace is described as being close to what readers probably think of with the term "space" as it's an airless void between worlds... However, each set of worlds (a 'Solar system' althoguh it could be bigger, smaller, or have unique rules) is contained in a crystal sphere. But then there's the Phlogiston, which exists between the spheres. it's described as "turbulent, unstable, multicolored, fluorescent gas" and is more mysterious. Planets and similar. There's not a lot of set details: Visit enough Crystal Spheres and you might see cubic worlds, flat worlds, etc. As a general rule, atmosphere is thicker or deeper the larger a celestial body. This is a quick introduction to a major setting element... We'll jump into more detail on world types and classification systems later. Wildspace is the medium within a crystal sphere. it's a void, but an important concept here is that all objects carry a little atmosphere with them (an "Air envelope") so breathing in space is a long-term concern (as you breath the air you've brought with you) not a short term concern. As a rule of thumb, most creatures have 2d10 turns of air in their envelope. Ships generally have the mass to have a larger air envelope to give the crew breathing room (my bad joke, not Jeff Grubb's!) they need. Every body in space has its own gravity. Gravity is an accommodating force in that its direction seems to be "that which is most convenient." Or, to put it simpler, Gravity in Spelljammer does what it needs to do. Spherical planets have what I'd call 'point' gravity (going to the center) while ships have gravity along a plane that is generally about where the water line would be on a ship. The sidebar explains how this 'gravity plane' works: it's kind of like bobbing on the surface of the water, but both sides are valid. You can walk on the bottom of a ship the same as on the to deck. Most ships don't take advantage of the gravity plane concept and one explanation for the wings and legs seen on many designs seems to be extending the air envelope and gravity plane. having a reversed deck would make landing on a planet uncomfortable. Note that later designs (Well, perhaps actually earlier designs in the fiction) messed with this rule, adding reversed deck on a few ships, generally ones that didn't make landfall and were intended to be 'alien' to the players. Gravity was mostly hand-waved, I feel. They mercifully avoided trying to calculate the center of mass or similar that it might be used one. One other interesting note about gravity is it seems to be mostly 'binary.' You either have gravity or you don't. The rules don't, as far as I know, distinguish between the gravity caused by a 10 ton scout ship and a 100 ton battleship. The bigger ship will 'win' and force the smaller ship to use its gravity if the two get too close, however. A ship's Helm is its power source. We're told that other types of helms exist, but the primary helm is the Spelljamming Helm which requires a caster sit on the helm, which is a magic throne that is bolted to the ship. The helm drains the caster's magic to make the ship go, controlled by the helmsman. Ships can move faster if a more powerful caster is the helmsman. Note the terminology used: Shells, not Spheres. Later material would settle on the term Crystal Sphere as I remember. Essentially a big shell enclosing a group of planets, creating a Wildspace region. usually the radius is about twice that of the farthest object orbiting the sun or planet in the middle, but that's not a hard rule. it's noted as appearing flat if anyone gets close to it, since it's unfathomably huge. The spheres consist of an unbreakable, dark, ceramic material of unknown origin. The spheres being impenetrable is an important setting element to me. They have a few other unique traits, however: They don't appear to have gravity on either the inside or outside, they're immune to almost all magic (there's spells to open portals coming up). They have portals opening randomly in them, too. It's noted here that they can be passed via a few common spells (Teleport, Dimension Door, Phase Door) despite most material taking the point of view that magic (and psionics) can't cross the sphere boundary. I'm wondering if this is an intentional loophole that you can cross it if and only if you're jumping from the inside to outside (or vice versa) as opposed to jumping from one side to a location farther away. Or the rule blocking teleporting through is just to stop players in the Realms getting Teleport Without Error and deciding to take a bunch of cheap steel to Krynn to destabilize economies and annoy the DM. Oh, and a few monsters (and the capital-S Spelljammer) can open portals just because they're cool like that. Some systems may have stars or other objects of interest on the surface of the crystal sphere. These might be fiery masses or similar, and may be portals of their own to other planes. Other options mention include painted lights or great alien cities that glow to create the stars. Crystal Spheres are also boundaries to Powers (the phrase used here is "gods and other-dimensional creatures") with a ntoe that divine spells of levels 1 and 2 aren't blocked. We'll cover priests in a bit. A later note will state that the big 3 D&D settings of this era are a stable triangle that can be relatively easily navigated. This is the psychedelic lightshow that exists between worlds. It's breathable, but also highly flammable. it's got a lot more and varied 'mass' than Wildspace's void, and so navigating it is a skill of finding rivers going the right way and avoiding regions where it's dense and sluggish. The phlogiston is explicitly 'outside' the normal four elements. The flammability is our fist real rules example in the rules so far (ten pages in!) with a brief table explainign how bad of an explosion various fire sources cause in The Flow. Fireball spelld (or flame-based attacks) are at triple effectiveness. However, It is noted that a lot of fire spells were hazardous to use as they created fire at the caster which traveled to the target: in the Phlogiston, it exploded on creation instead of traveling. Other sources are defined as a number of die of fireballs: For example, a lit match is a 1 die fireball, in a 4" area. Basically, ships must have fire-discipline when in the flow, and crew will have to deal with cold rations during the trip. Light is also difficult. Travel int he Phlogiston is intended to be stressful, I feel. There's a possible odd reference to dwarven mountain-craft not worrying about the darkness due to the Dwarven infravision. That's fine, but I think it will be clarified later that dwarven mountain-craft don't go in the Phlogiston as they're powered by a special helmv ariant that is a gigantic forge and thus fire-based. Next time: Taking your breath away. I'll never stop being surprised how natural space travel feels in AD&D 2e. As if it was just waiting to happen. That said, I'm not the biggest fan of the crystal spheres or connecting the worlds. IMO Spelljammer works best if it's just Spelljammer. I don't know. I think merging Spelljammer and Star Frontiers could be potentially fascinating. Take the Frontier Sector, but place each world in its own crystal sphere, separated by the explosive phlogiston. They already stole the vrusk, dralasites, and yazirians, anyway. Mix in D&D weirdness with alien weirdness, planet hopping, space police, and starship battles on the edge of a black hole. Nice that you are doing this Let's Read. I got some of the the Spelljammer materials some months ago and read them, first time in years. It's brilliant stuff, and I like it. We had a good Realmspace campaign when Spelljammer was new, so I'm interested in this, too. It's pretty honest, though: There's a note that they knew they couldn't "overturn existing campaigns" which presumably meant nuking the Realms was off the table. They wanted to make this a link between the AD&D worlds (defined as the Realms, Krynn, and Greyhawk as of this writing) and created a setting and rules to allow this. This, in my opinion, one of the main flaws of Spelljammer. As presented, it is mostly a toolkit instead of a setting in its own right, the same way that the old Manual of the Planes was a toolkit. The latter was turned into a fascinating setting in its own right with Planescape, but the toolkit nature of Spelljammer remains. Establishing the links to the existing AD&D worlds drew attention away from the setting itself. With the armor on one arm and one side of her chest, she looks like a fencer or duelist. The crystal spheres are obviously based on the concept of celestial spheres (as in Aristotle's Metaphysics), which was an attempt by early astronomers to explain the motions of the planets. The basic theory is that all the planets are embedded in clear, crystalline spheres, and these shells form concentric circles around the Earth. And since stars didn't (observably) move, there was a final sphere, encompassing all the planetary spheres, in which all the stars were embedded. In this model, there was no space. The concentric shells are thick; like the layers of an onion, the outside of each sphere was in contact with the inside of the next sphere. The spheres themselves were made of quintessence or aether, which is another natural science theory that dates back to classical times. It's an element, but it's a celestial element with entirely different properties from the four terrestrial elements (air, earth, fire, and water) -- which correlates with Spelljammer's phlogiston. Though phlogiston is also drawn from (and named for) a hypothetical substance used by pre-modern natural scientists in an attempt to explain combustion. In a nutshell, objects contain phlogiston, which is released into the air as they burn. It's interesting how they took a set of outmoded theories, mixed them up with a modern understanding of outer space, and then wove them together with fantasy tropes into something new. Spelljammer has one foot set in the Lyceum, while its second foot is planted on the International Space Station.... But it also has a third foot that's wandering across Europe with the early modern scholars of the Scientific Revolution, and a fourth foot (emerging from some improbable place) which has broken the fourth wall and is firmly affixed to the ground in Fantasy Land. I think the appropriate term here is "swashbuckler". Spelljammer came onto the DnD scene before I did, and by the time I got around to the game was pretty hard to find (doubly so since by far the majority of my early DnD purchasing was from chain book stores like Waldenbooks and B. Dalton, and neither seemed to carry anything other than new releases and your basic PHB/DMG/MM combo). 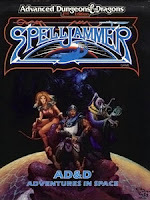 Still, I grew up always hearing about Spelljammer from other books referencing it and gathered enough of the setting to have a bit of an idea what it was about. Always thought it a shame I missed it. Which is to say, hooray for this thread, and so looking forward to where this is going.